Can you feel it? Summer's right around the corner! The days are getting longer... the water's warmed up a bit- and there's even been some south swells! You know what that means right? Time to order up a fresh board. Nothing keeps you motivated like waiting for a freshy. And nothing keeps you progressing like stepping on a new shape. If your surfing is feeling stale, blow it up by switching it up. Get yourself to a boardsmithand sit down for a chat. Talk about where you're at and where you want to go and then just let the magic begin! Shoot... I think I just convinced myself! That's an 8'6" on the left and a 10'0 on the right. Both are Viking model stand up boards. Clean, fast and loose- these are boards meant to be driven, not cruised. These are step-up boards- if you're still working on balancing and like your boards nice and stable, heavy and predictable- these are not for you. Everything about the Viking is high performance- search out some Future Fins 3/2/1s for the sides (preferably in G10) and you've got a board that's a blur. Go rip cutbacks and lippers- this is the one that'll take you there. 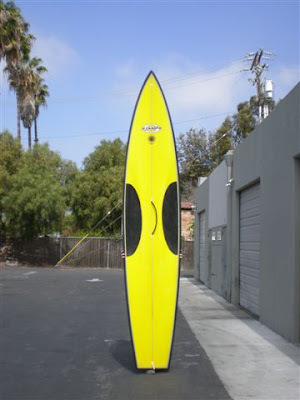 Here's a new Stock Class (12'6") racer for the California series races. Carbon fiber bottom for stiffness, foot wells, some other stuff I'm not at liberty to divulge. Rad. More of a hull than a "board", don't you think? Are you convinced yet? Take that tax return and go stimulate the economy. Saving is for wussies... be a good American and go spend some money! Paddle surf lessons in sunny San Diego! 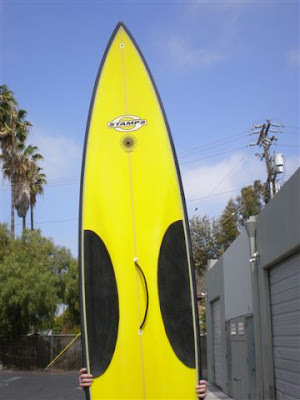 Give me a call 619.213.6622 or email john@paddlesurf.net come learn the Ashley-method of stand up paddling. Want more information? Click here! May I ask...what is the width and thickness of the 8'6"? boards some kind of art thing? Watch out! I'm on Spring Break and I've got weekdays free... and... I KNOW WHERE YOU SURF!!!! 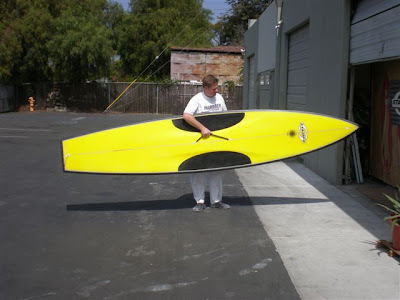 I'll get those dimensions on that 8'6" soon! Ha! I just went back and noticed that- funny. I don't know, seems like ART to me- I'll just say that looking at new Vikings- MOVES ME.... to want something new myself- so, yes, it must be ART.